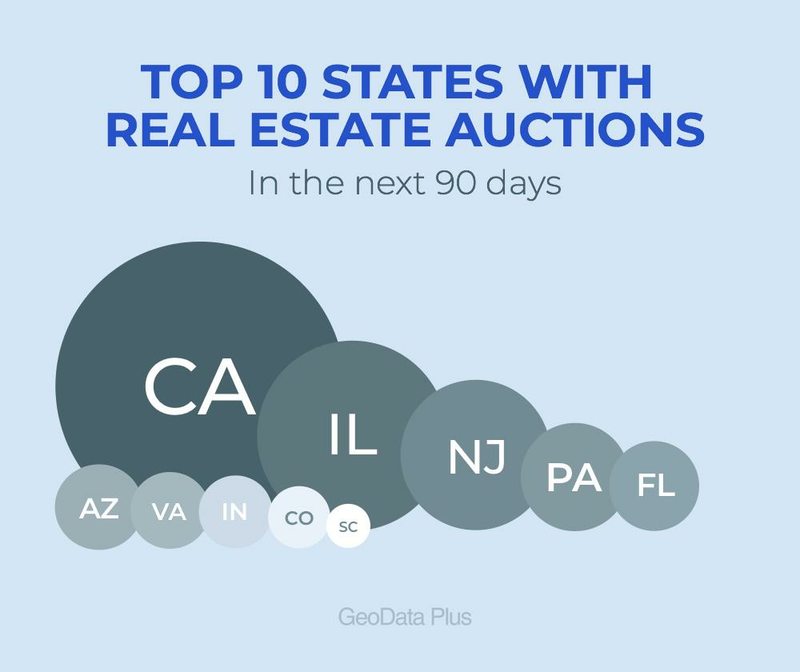 As you may know, when GeoData Plus expanded nationwide, it also added a nationwide foreclosure database that includes preforeclosures and auctions. Foreclosure auctions were also made available in New York State. Are you familiar with how foreclosure auctions work? Just as important, do you know how real estate professionals can use a property data source such as GeoData Plus to find distressed properties to list or purchase? What is a Foreclosure Auction? Foreclosure auctions can happen for a variety of reasons. The most common being a default on a mortgage loan. If not cured in time, lenders (or local authorities) can force a foreclosure auction. Properties are then auctioned off live to the public. They are sold to the highest bidder. This may be the bank, an investor, or other buyer. The winning bidder gains title to the property, and the old homeowner loses any right to redemption. Properties can then be fixed, flipped, resold for a profit, rented out or lived in as a residence. These types of distressed properties are highly attractive to intelligent buyers for the big discounts which can be found. Depending on how competitive the auction is they may sell for the amount of debt owed, or an attractive discount. You will typically find a minimum opening bid, at which the auction starts. Most foreclosure auctions are a result of a past due mortgage. But others are a result of past due property taxes, condemnation for poor property condition, liquidation of seized or unwanted government owned property, defaulting on insurance requirements or other types of contract breaches where the home is collateral. The mortgage process and timeline can vary between states, counties, and as regulations and volume of foreclosures change over time. In judicial states like New York, New Jersey and Florida, the foreclosure process is handled through the court system. This takes significantly longer than in non-judicial states. After the borrower is sent a Notice of Default (NOD) the lender will typically files what is known as a ‘Lis Pendens’.. Lis pendens is loosely translated as “suit pending”, or pending legal action. It is the first notice to the public that a property is facing trouble. We have previously published an article on lis pendens, where you can learn more about that aspect of distressed properties. In non-judicial states, the courts do not have to be involved. States like California, Michigan and West Virginia allow a trustee to force an auction sale once the borrower falls into default. This can all happen in as little as 120 days. It can be much faster than that if it is a commercial property. How Long Does it Take for a Foreclosure to Occur? While every state, and every property is different, here is the current foreclosure process and anticipated timeline in New York State, according to NY State’s Department of Financial Services. 90+ Days: Lender begins the legal process, files for foreclosure proceedings, a ‘Lis Pendens’ is filed in public record. A foreclosure auction will typically be scheduled within 4 months of the court reviewing the filings. Note that at the peak of the foreclosure crisis New York was among the states with the longest foreclosure process. According to the state, this foreclosure process takes around 15 months from the first missed payment until the foreclosure sale. While this is what is published on the State’s web site, there is substantial anecdotal evidence stating otherwise. GeoData Plus recently attended the MLSLI Tech Fair, with Erik Wind appearing as a guest speaker on the topic of distressed properties. When this statistic was mentioned, there was a great deal of debate and pushback from the audience who thought the local foreclosure process was taking much longer than 445 days. Traditionally, foreclosure properties are auctions at a public county courthouse. These sales are advertised. You can attend and bid. These are all cash sales. You will need at least some of the funds on the day to place your bid. How much these homes and commercial properties sell for varies depending on the amount of debt owed, the lender involved and how much competition is present on the day of the action. If the property does not sell, or the lender is the highest bidder, it becomes real estate owned (REO) by the bank that made the loan. Real estate agents and investors who use GeoData Plus stand to benefit from auctions, if handled properly. GeoData Plus has a nationwide foreclosure database (both lis pendens and auctions). Customers can search for upcoming auctions, and then use the comparable search tool to determine the value of each property prior to the auction, in order to determine their maximum bid. Here is an article on sales comparable searching, and how you can search for comps in GeoData Plus. Not all of the action happens at the auction either. Many real estate practitioners learn about upcoming auctions, and make efforts to purchase the property prior to the start of the auction. Using GeoData Plus, real estate professionals not only can find lis pendens and auctions, but get in depth property data and accurate comps. This way you’ll never over bid, or misguide a client and burn a valuable relationship.